A mix of bit old school traditional with a modern twist, the signature VIP High Tea Experience at Woodman Estate offers an afternoon tea in gorgeous surrounds with a view and food designed to indulge. 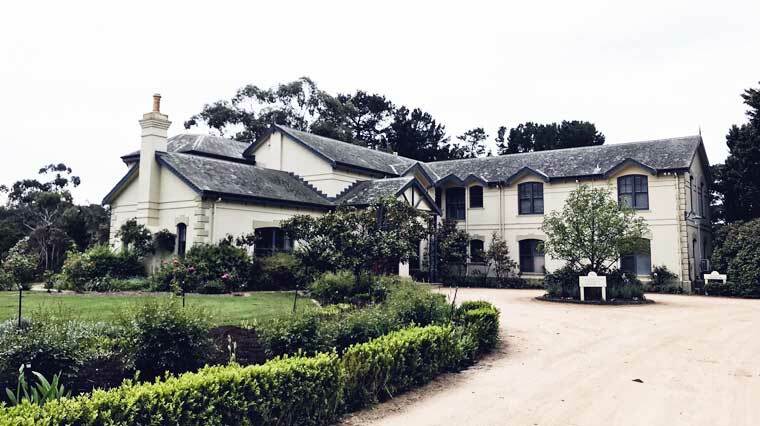 A true country escape, Woodman Estate is located roughly an hour outside of Melbourne but feels a world away. 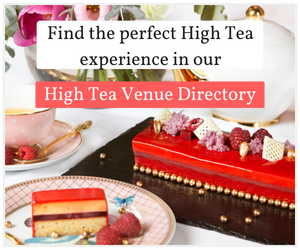 Offering accommodation in private chalets, a spa, dining and now health retreat options, it’s truly a getaway, even if just to experience a two-hour high tea. 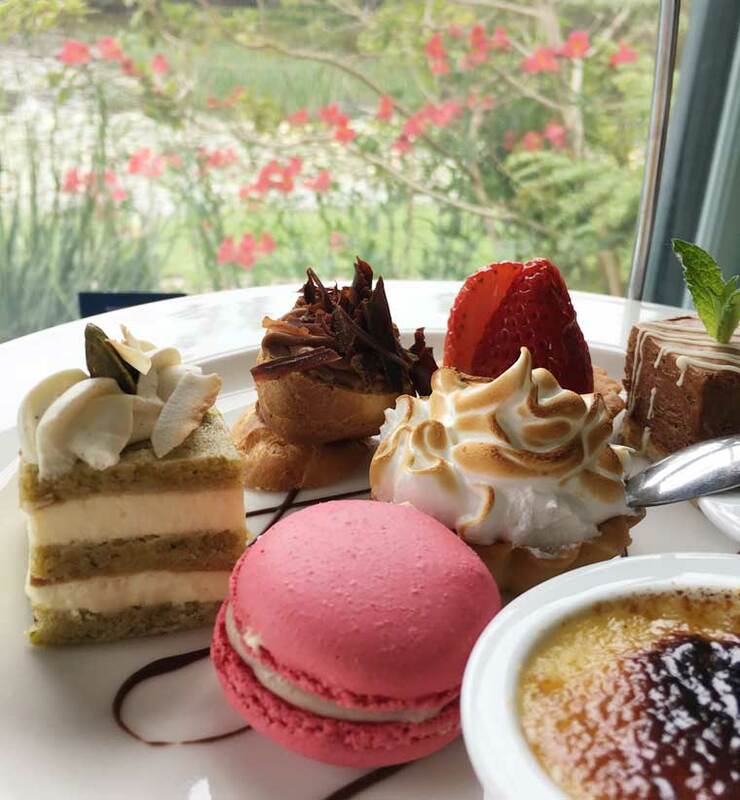 Woodman Estate is set within 50 acres of gorgeous pastures and bushland and sits aside it’s very own private lake, which at the time of our high tea was full of blooming flowers including waterlilies and birdlife. Post 1945, an apple and pear orchard thrived here until the land was acquired by an English family and in 1988 the Victorian style manor was built. There’s also a nearby garden of box hedges and rose gardens. 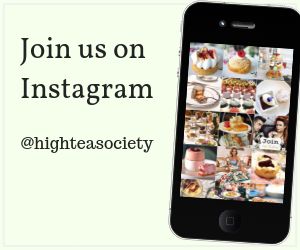 High tea here is a traditional affair of a bygone era with just the right amount of modern touches. Guests enter and are seated in the Estate’s Drawing Room to relax while the wait to be seated. We’re escorted to the formal dining with spectacular views over the lake and offered a glass of sparkling with our high tea menus. The setting here is traditional and formal with linen table coverings. We enjoy our glass of bubbles and the view and before long our three-tiered tray arrives full of treats. Created under the direction of Chef David Brun, the menu here is nothing short of outstanding and ample. The bottom tier includes traditional finger sandwiches including roast pork with honey and thyme, horseradish, sour cream and cos lettuce as well as a vegetarian rocket pesto with mozzarella and semi dried capsicum. There’s a traditional chicken with fresh greens and poached salmon with lemon myrtle and watercress and lastly, a rare roast beef with black pepper, coriander, red onion and grain mustard mayonnaise. And that’s just one level. The portions here are incredibly generous so skip lunch and ensure you arrive with your appetite. It’s also important to note that the menu can be adjusted to suit dietary requirements. Please advise at the time of the booking however to avoid disappointment. One the middle tier you’ll find warm savouries such as walnut and feta sausage rolls, a vegetarian quiche (served with a house made tomato relish we loved so much we had to buy a jar to take home!) and crumbed scallop with dill and ginger mayonnaise. Top level sweets included a pistachio tiramisu, lavender crème brulee, dark chocolate dacquoise, a strawberry macaron, short crust strawberry tart, lemon meringue pie and a petite chocolate éclair. All served of course with an enormous selection of loose-leaf teas as well as coffee and hot chocolate for the younger ones. From there guests get just a short break to relax and make room for the freshly baked scones served both with and without fruit and with estate made strawberry jam and cream. It’s important to note that Woodman Estate makes a delicious range of house made jams and condiments that are served with the tea. Guests who enjoy the VIP experience also receive a takeaway selection of three mini sized versions to take home. Made from fresh locally sourced produce, foodies will certainly appreciate not just the deliciousness but the farmgate to plate standard delivered here. After trying only a bit of the tomato relished served with our warm savouries, we were incredibly keen to buy a jar alongside a second jar of spice pear preserve to enjoy later. Woodman Estate’s Signature High Teas can be booked on Wednesday, Thursday, Friday & Saturday at 2.45pm and Sunday at 3.45pm. Traditional High Tea can be booked in the brasserie or atrium starting at $69 per person, the Signature VIP experience (as described above) is located in the formal dining area and includes a glass of sparkling on arrival, premium seating and a takeaway gift, starting from $120 per person for a two hour seating. Woodman Estate delivered quiet country charm for this high tea experience. It’s traditional but not frumpy, sophisticated and yet still very friendly and can accommodate small groups should they be pre-booked. There’s also options to pair up your high tea experience with a relaxing massage experience to fully treat yourself. 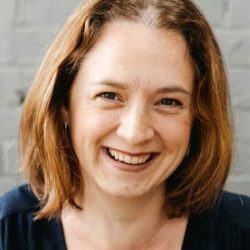 Gwen Luscombe is a freelance food, travel and lifestyle writer based on the Victorian Mornington Peninsula. A lover of a good chicken salad sandwich, tea of all types and a good book, you’ll find her working beachside with a pot of strong Earl Grey, and a whole lot of wanderlust.